One day I saw two elderly brown women climb into Bus No 144 at the Sperling Sky Train Station in Burnaby, British Columbia. They disembarked at the first stop on Sprott Street. Opposite this stage, behind some green trees and bushes, is the Ismaili jamat khana or the prayer house. In their bare hands, the Bais (we call women Bais in the community) held white plastic bags slumping down with weight. One woman was wearing a long dress under a brown artificial fur collared blue jacket and boots that seemed awkward to walk in. It was a murky grey winter evening and sleet rain. For a hundred and more years, the two bais' mothers, grandmothers and aunts came to the jamat khana about the same time, around seven in the evening, at the equator in Africa between the Indian Ocean and the Atlantic. In the plastic bags, wrapped and carefully packaged so no spicy fragrance escapes, is the day’s offering, a portion of the family meal they have prepared that day, a prayer of thanksgiving for the day’s nourishment, for peace of the ancestors buried in Africa, for those who died in Canada after their second epic migration, and for blessings of contentment and gratitude that you often hear the Satpanth Khoja whisper, “santosh” or “shukhar”. My name is Sultan Somjee and I am an ethnographer. Writing about the two Bais on the bus route no 144 in Vancouver brought flash backs from stories told to me while I curated exhibitions on the Satpanth Khoja and Asian African migrations and settlement in East Africa. I linked the old stories from India and Africa with the new stories that are now told in North America and the Western world. 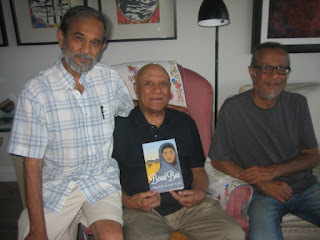 The stories from the three continents continue to create powerful images laced with feelings often stirred by family photographs and artefacts. These stories unfold overlapping layers of changing culture, politics, identities and styles of worship of the Satpanth Khoja who comprise the majority ethnic group among Ismailis in Canada. An estimate suggests there are about a hundred thousand Ismailis in Canada. Bead Bai is narrated by Sakina who later came to be called Moti Bai. She narrates like the old Satpanth Khoja storytellers speaking in lyrical prose and verses, metaphors and anecdotes. Often their stories move into the realm of mythology. Their tender words merge with Saurashtra’s ancient oral traditions that have flowed over generations since the time of Buddha from parent to child and from elders to communities. A Khoja Bead Store in Nairobi in 1920s. Notice the Bead Bais and the display of beads in the background. Shop's proprietor Janmohamed Giga Bhimji Khimji is seen sitting with his sons to his right and his wife and daughters to the left. The character of Moti Bai is inspired by lives of the ‘Bead Bais’. 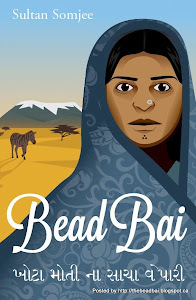 The Bead Bais like Jethi Bai and Santok Bai I knew, worked on ethnic beads in their family stores in the most remote places in Africa at the equator. The task of sorting out, counting, pairing, matching, stringing and displaying hundreds of beads of tens of different sizes, colours, lustres and shapes was tedious and back breaking. The men folk would not work with beads for this work required patience, meticulous concentration, beading skills and the eye of an artist. Sometimes the Bead Bais got children to help them. Drawing by Nizar Kanji, grandson of Ma Jethi Bai. The arrow points to where she used to sit in the veranda. Notice panels on which were hung strings of beads for display, to view and touch. Attached to the store were family rooms and a courtyard. Behind the home was the market and in the background stood Mt Meru. I first learned to touch and know African beads in my childhood at my uncles’ bead store in Arusha, Tanganyika, where their mother, Ma Jethi Bai, sat all day long sorting out and grouping beads and strings in patterns. Next to her sat Daudi, her Maasai assistant and mentor on beads. The Bead Bais raised many children. Today many of the descendants of the Bead Bais are first and second generation Canadians. Ramzan Rajan Laji’s father started the first Bead Store in the main Indian Bazaar of Nairobi in 1905. Ramzan's grandmother, Fatma Bai would be among the first Bead Bais at the turn of the 20th Century, three years after the completion of the Great African Railroad. The Rajan Lalji Bead Store later became wholesale suppler of beads to mainly Ismaili Khoja traders in Nairobi and the interior. Rajan Lalji and Fatma Bai would probably not have imagined then how their pioneering venture would lead to one of East Africa's largest art production employing hundreds of skilled bead artists and agents. Most importantly, today the continuous flow of beads to the most remote ethnic communities enables the indigenous and largely feminine art heritage of East Africa to flourish. Later in early 1950s when Ramzan Bhai started a family store in Kigali, he carried bead samples to test out preferences among the ethnic people of Rwanda and then began displaying and selling beads in Kigali among other things as his grandfather had been in Nairobi half a century ago. Though inspired by real events and people, this is a work of fiction.